Bisa or Beesa Yantras are considered to be the among the most powerful and effective of the Hindu devotional Yantras. These Yantra usually dedicated towards the Mother Goddess Durga Mata are believed to be most potent in removing and resolving hardships, problems, obstacles , enemy problems and other hardships, including those relating to job, business and finance. 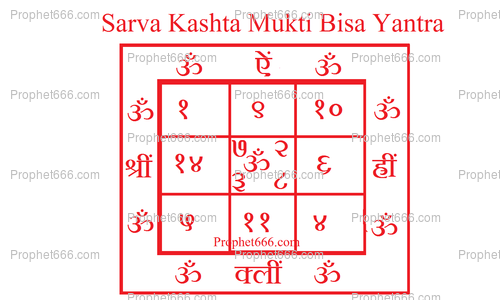 In the past, I have described the making and using procedure of certain Bisa Yantras, in this post, I have described yet another powerful Bisa Yantra and the Shakti Mantra to enhance its power and potency. The Bisa Yantra shown in the image should be drawn on a Bhojpatra with either Kesar paste [Saffron paste, Rakta Chandana [Red Sandalwood], Gorochana or Ashtagandha using a pointed twig of the Anar tree [Pomegranate tree]. The Bisa Yantra should be worshiped for 27 days in a row and the Shakti Mantra – Aim Hreem Shreem Kleem Namah || - ऐं ह्रीं श्रीं क्लीं नमः || should be chanted 108 times every day without fail during the course of the 27 days Bisa Yantra Sadhana. This Shakti Mantra is believed to energize the Bisa Yantra and greatly enhance its power. Then after the completion of the 27 day Bisa Yantra Sadhana, it should be folded and inserted inside a Silver Locket and worn around the neck like a good luck bringing Talisman. The practitioner should regularly worship the Bisa Yantra, offer it Dhoop, and chant the Shakti Mantra at least once with full faith and devotion towards the Mother Goddess. At times many problems are going on at time. We may find need of more then one yantras for us, so how do we wear them around neck. Can we use single thread and different different lockets for yantras, can we wear more then one yantra at time ?? If using more than one Yantra, then you have to use them separately as described in the respective articles. I can not find bhoj patra. Can I use white paper. Bhojpatra can be found in most places in India, if unable to do so, you can make the Yantra on white paper with red colored ink. Once it's in the locket then to worship, should we just worship the locket or take out the bhojpatra?